A British nurse of Dominican parentage has been featured in Nursing Times, a leading publication of the profession. The article written by Senior Reporter Gemma Mitchell, tells the story of top nursing professor Laura Serrant who was recently honoured by the Queen. In an interview with Nursing Times, Professor Serrant said her professional endeavours had been "completely grounded" in her Dominica heritage. 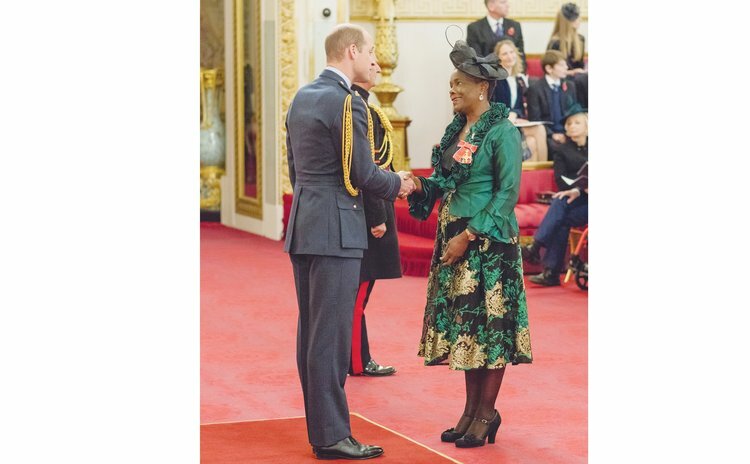 "Fittingly, Professor Serrant was handed the medal from Prince William on the last day of Black History Month and in the same week of the 40th anniversary of Dominica independence," Nursing Times said. After the ceremony at Buckingham Palace, a celebration was held at the Dominica High Commission in London, which was attended by high-profile figures in the world of nursing and midwifery including Professor Dame Elizabeth Anionwu, Baroness Watkins of Tavistock and Professor Jacqueline Dunkley-Bent, the article reported. Dominica's High Commissioner Janet Charles was due to fly out to the Caribbean the day before the event but delayed the trip so she could be there to congratulate Professor Serrant. Seth Ramocan, the High Commissioner of Jamaica, was also in attendance. Professor Serrant, 54, said she was "shocked, surprised and humbled" to receive the OBE. She added: "It meant a lot not only because what it means being a nurse getting that award, but it means quite a lot because my work has focused on the marginalised populations. In 2001, Professor Serrant worked on the creation of the first national strategy for sexual health and HIV for England. She was also a key player in the development of the latest nursing and midwifery strategy called Leading Change, Adding Value, launched in 2016. Professor Serrant is currently chair of the chief nursing officer for England's black and minority ethnic (BME) strategic advisory group. Her parents emigrated from Commonwealth of Dominica in the 1960s. She has worked closely with the country's nursing community and in 2011 was asked to give a speech at a nurse graduation ceremony there. Professor Serrant, who qualified as a nurse in 1986 and was one the first to complete a four-year nursing degree, studying at Sheffield City Polytechnic, said her Dominica heritage had informed much of her career choices. "Growing up in the UK in the 60s and 70s at a time when there was a lot of more direct racism and direct exclusion, that shapes you, but also I think certainly from my heritage being from such a small island, the ethos of working hard and education and actually nurses are held in such high esteem there that it's a real honour to do the role," she said. "That's something that comes very much culturally. "Nurse itself in the Caribbean is a given title in the same way you call someone a doctor, they will call you nurse," she said. "It's actually seen as a very revered profession. "On all accounts, whether it's my work as a nurse or my work around inequalities and making sure that we have much more equity in healthcare, I think both are completely grounded in my cultural background and my pride as someone from Dominica," she noted.